The Aesthetics Clinic (TAC) was first established in 2005 to provide a plethora of aesthetics solutions by a panel of qualified and experienced doctors. TAC also ensures that their customers receive only the best and latest in the aesthetics field. Their doctors are constantly kept abreast of the latest equipments and procedures available through international medical forums. During my first consultation with Dr Francis Tjiang, I expressed my concerns with my skin and also questions about the treatment. 1. Tiny bumps on the sides of my face. 3. 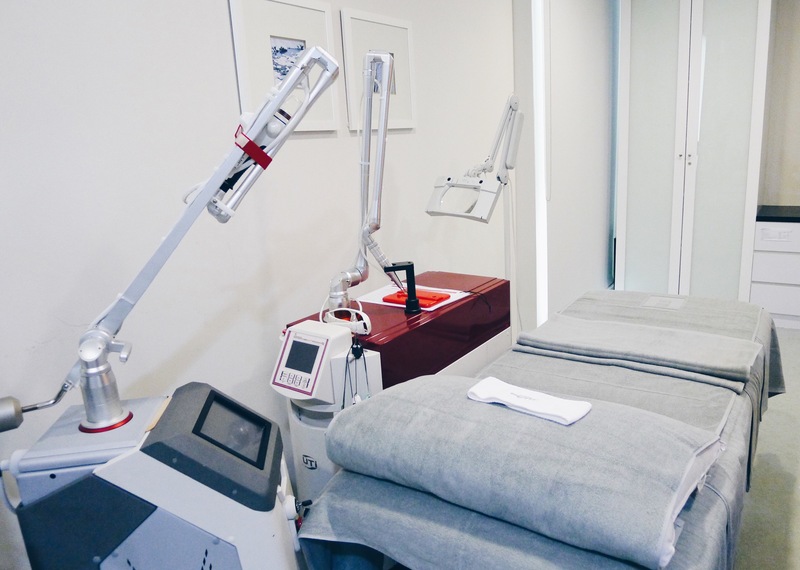 Whether my sensitive, eczema prone skin is suitable for the Korean Hybrid Laser Treatment. Dr Tjiang analyzed my skin and explained to me how this latest laser treatment can help address my top 2 concerns. As for pointer 3, since I am on long-term medication for my sensitive skin, my skin is pretty much under control. Dr Tjang suggested that I start with a low intensity treatment and reassured me that he will do a trial test on my forehead to test check if my skin can undergo the treatment. The treatment room. I was quite nervous as you can see from the picture above. It was my first time undergoing a procedure for my face and I have no idea what to expect. Before the treatment, Jeannie (aka the clinic assistant) removed all traces of makeup and cleansed the face thoroughly. I thought that she did a great job being gentle and attentive 🙂 After cleansing, Jeannie applied a layer of numbing cream and left it on for 15mins for it to take effect- my lips were numb after 10mins. After 15 mins, Jeannie tapped my face a few times to ensure that the numbing cream has taken effect. 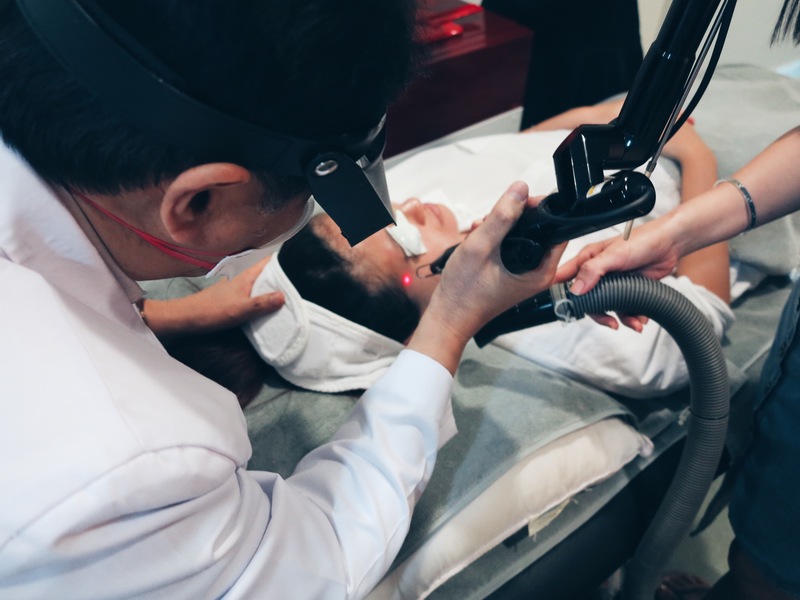 Dr Tjiang then proceeded with the laser treatment. Being a first timer to laser, the new sensation on skin and sound of the vacuum did scared me (I didn’t know it was the sound of the vacuum initially, haha. However even having low pain tolerance, the treatment was bearable for me. Before treatment picture. – red bumps on my cheeks and sides of my face – dull complexion Right after my first treatment picture. Dr Tjiang has reassured me that it’s a normal reaction of skin after treatment. Redness of skin actually indicates my skin is reacting the treatment. The redness after the first session had subsided 4-5 hours after the treatment. 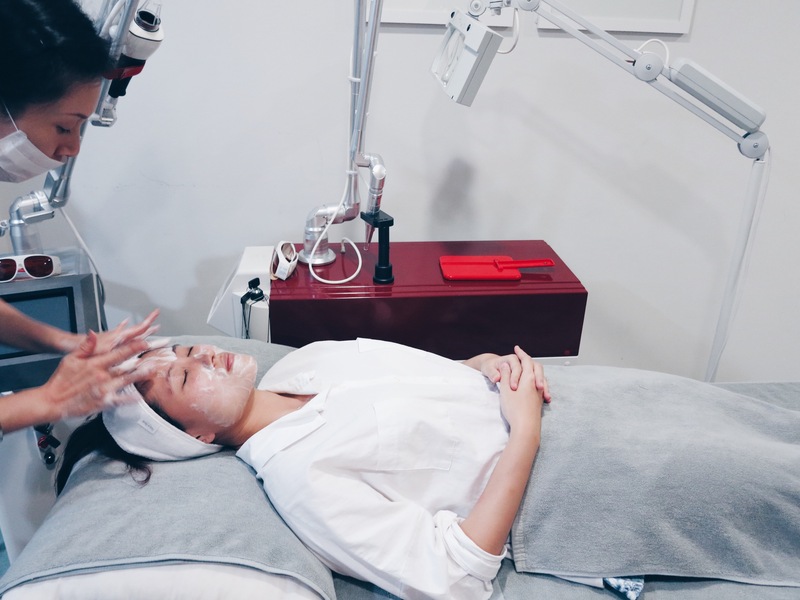 How the Korean Hybrid Laser Treatment works: The Korean Hybrid Laser Facial Treatment is a combination of Fractional CO2 Laser and Nd:YAG Laser Peel Treatment. The combination synergise the effects to achieve the potential “best” benefits from the two systems. The unique characteristics of such laser skin resurfacing allow more accurate and precise control over the treatment. The appropriate laser not only tightens the skin but also improves the appearance of lentigines, rhytides, skin texture, and a wide variety of scars. 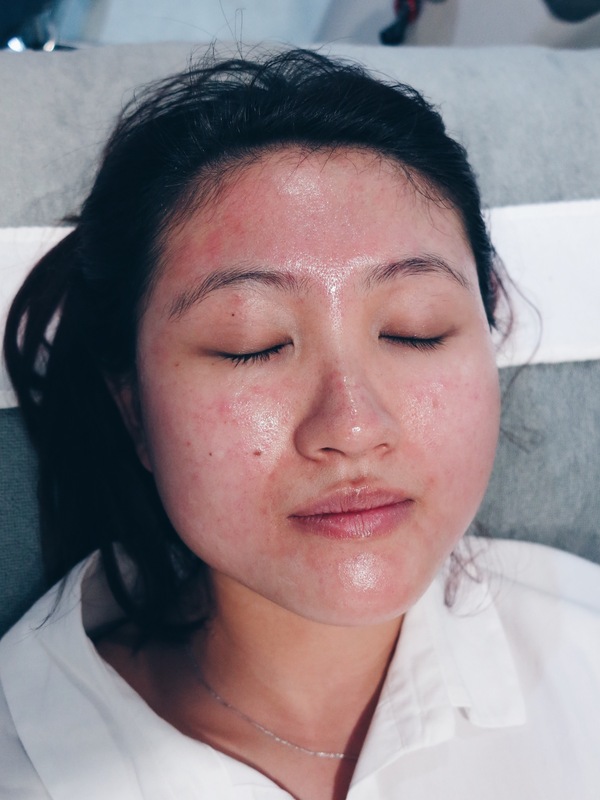 Cutaneous resurfacing such as the Nd:YAGLaser Peel treatment has achieved appreciable clinical results due to its less aggressive modalities for skin rejuvenation. Fractionating either laser distributes the effect, increasing the number of treatments but minimizing downtime. 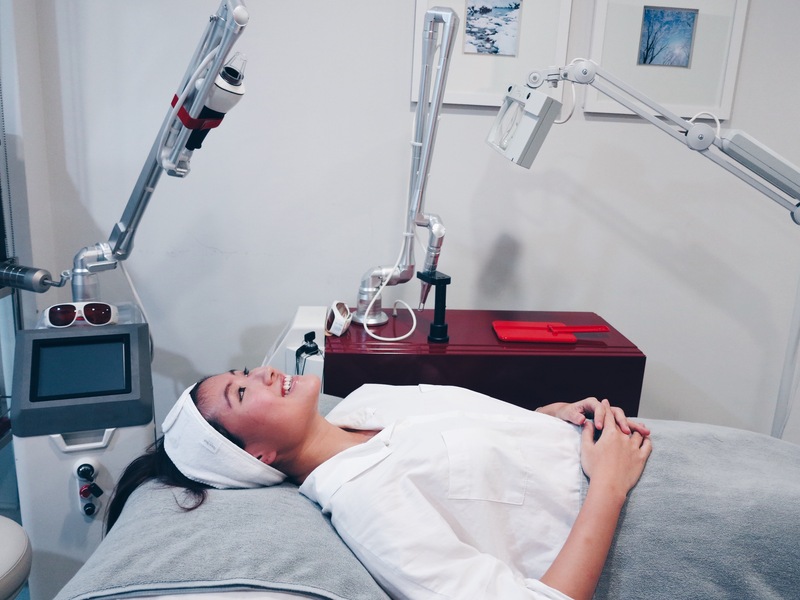 The laser treatment was based on studies that have shown that the ablative cutaneous injury induces a healing response, resulting in the deposition of a new skin matrix with improved characteristics. During this healing process, skin rejuvenation occurs by a proliferation of fibroblast activity, the action of inflammatory mediators, and a deposition of new collagen and other dermal matrix proteins. This skin resurfacing and rejuvenation treatment is well suited for all skin types and produces an effect that is perfectly graded to one’s expectations, while offering a degree of control and efficacy that allows for highly precise sculpting of the skin. Do take note that laser resurfacing is not a substitute for a facelift or blepharoplasty. Above diagram taken from TAC’s website for your easy understanding on Fractional Co2 Laser Treatment. Right after treatment, I was given antibiotics cream and Natura Bissé Post-laser Kit. Instructions on the application of antibiotics and skincare products was given by Jeannie. So 3-5days after my first treatment, unnoticeably my skin started to dry out smoothly – like a thin layer of dried up skin. Fret not, just spam the serum and moisturer! At that point of time, my skin was hungry for moisture. The cream was thoroughly within minutes. With proper instruction of product application, my skin is smooth and moist within 2 days. I had taken a few shameless selfless to show you my skin on the 6th – 10th day after my first treatment. Not trying to exaggerate but my skin was really good during my whole bangkok trip! All I need were moisture and concealer. Not only goodbye to bad skin days, the bumps at the side of my cheeks had also disappeared. I was really impressed with the results of the first treatment. Second session of treatment Applying numbing cream after cleansing. 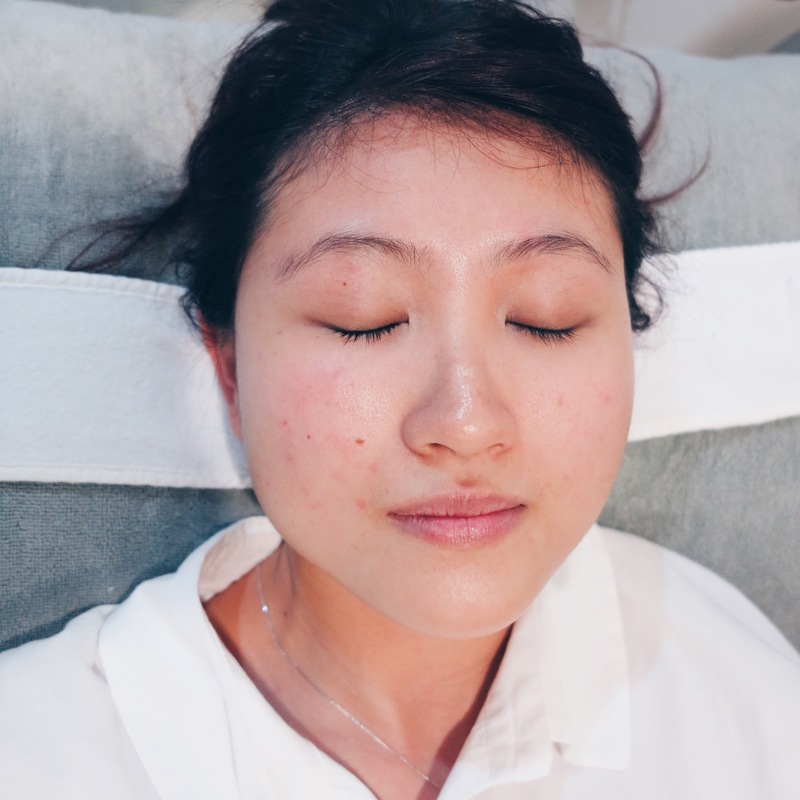 For the second session, Dr Tjiang increased the intensity of the treatment to medium for more effect and applied a layer of carbon on my face to clear the leftover dead skin particles on my face from the first session. The pain for medium intensity was bearable and this time round I was less nervous than before since it was a procedure I’m familiar with by now. If I were to comment on the difference between light and medium intensity, I do feel an ant bite sensation near my lips area as the skin there tend to be more sensitive. Selfies after second session: Skin without makeup. Not bad skin days as usual which is similar to the effects of the first session and if you notice my cheeks are slightly pinkish too (perhaps better blood regulation after the treatment?). Just in case the above details are insufficient, I have provided a mini common question asked list below: Who is suitable for this treatment? This face therapy is best suitable for clients who are facing pores, pimples and pigmentation problems. The skin rejuvenation process helps to improve overall skin texture, stimulate the production of new collagen, thus result in more lifted and radiant skin. We do not recommend clients that are experiencing ezcema problems to do the laser, however client may seek advice with our doctor. To avoid complications, pregnant ladies or breastfeeding mums are not advisable to do this treatment. Are the results permanent? The results should last around 1 -2 months, varies on different skin types. Any side effects and down-time from the laser? Clients will experience slight redness on skin after the laser. In the next few days, mild peeling will take place. In one week’s time, client will be able to see the optimal results of the laser. Can I apply make-up after the laser? Yes, however it is advisable to apply light make-up right after the laser. Normal make-up can be applied as usual the day after the treatment. The current price of the laser treatment is $88 for one session. For those who are interested in Natura Bissé products, just quote my name <CALEEN> to enjoy 20% off Natura Bissé retail products. For more information about the Natura Bissé Post-laser kit that I have tried, you may read it here. This entry was posted in beauty and tagged beauty, Korean Hybrid Laser, skincare, The Aesthetics Clinic.